Public program sponsored by the Whitewater Memorial Library's Friends of the Library on January 25, 1994. Eva Brainerd, Mildred Zuercher and Dixie Eberly were the featured speakers. 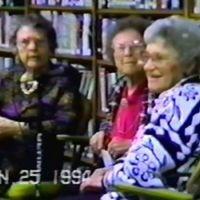 Whitewater Memorial Library, Whitewater, Kansas, “As I Remember - Eva Brainerd, Mildred Zuercher and Dixie Eberly,” Digital Whitewater, accessed April 19, 2019, https://whitewater.digitalsckls.info/item/13.